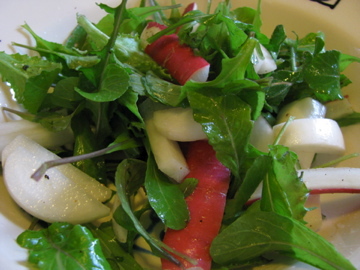 One of my thanksgiving highlights was picking arugula from my garden on November 27th for a delicious lunchtime salad of arugula, baby white turnips and radishes. We had a non-traditional pot-luck thanksgiving dinner. Not a turkey in sight, but a feast nonetheless. Here is the menu. 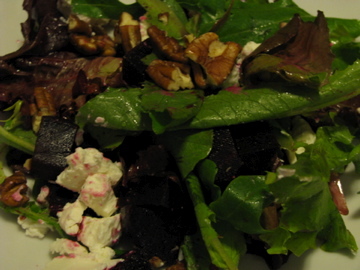 Beet, goat cheese, pecan and mixed green salad made by Suzanna. Leek and potato soup with crumbled bacon served with honey wheat bread and home-made butter. Delicious Italian style lasagne with home-made fresh spinach pasta, béchamel and ragù made by Andy. A feast of cheeses with home-made flax seed crackers. 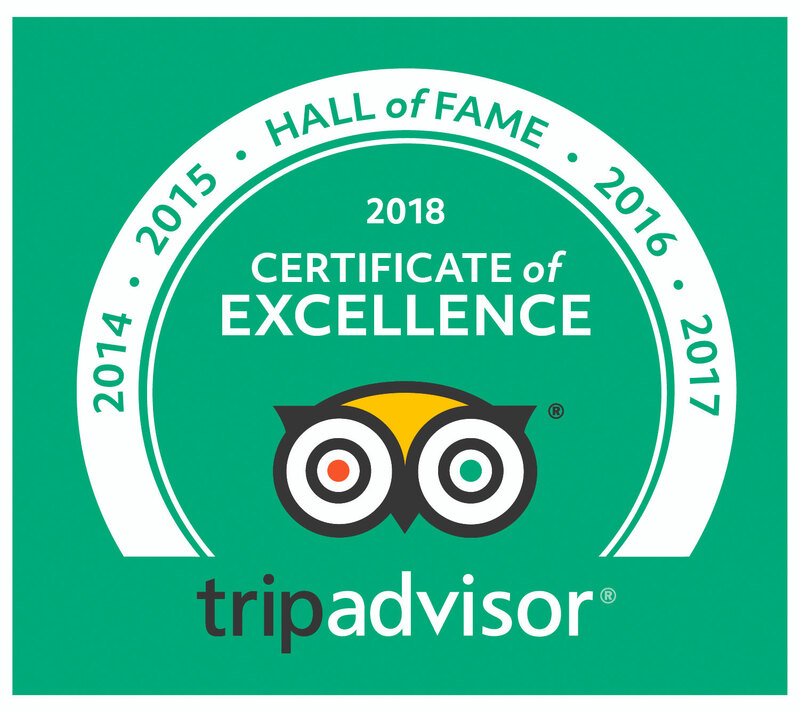 The cheeses included Morbier, Wensleydale, Joan of Arc brie, Shelburne farms Vermont cheddar, Lake Erie Blomma, Maytag Blue from Iowa and Amablu from Minnesota and Roaring Forties Blue from Australia. 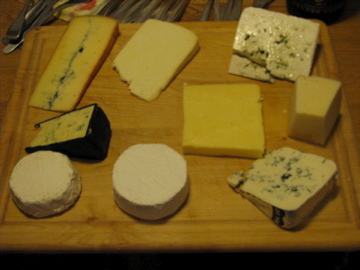 The cheeses mainly came from Curds and Whey in the North Market and Katzinger’s Deli. My favorites were the Blomma, Morbier and the Roaring Forties Blue. 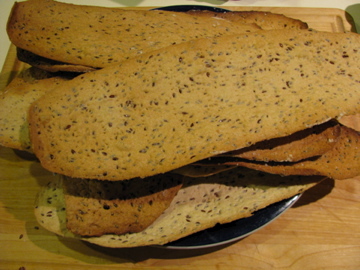 The crackers were based on Heidi Swanson’s olive oil cracker recipe, but with added flax seeds and different flour. This was my first attempt at making crackers, inspired by the Slow Food Potluck dinner. I borrowed a pasta machine to roll out the crackers and had an able assistant. It is hard to give quantities as I was making it up as I went along and it doesn’t really matter – can be infinitely adapted to taste and based on what you have on hand and want to use up. 1+ cups uncooked Lundberg wild grain rice blend. couple of cloves of garlic, chopped or crushed. Boil the cabbage whole in a large pan of water for about 5 minutes. Peel off the outside leaves. Return the rest of the cabbage to the pan. keep repeating until you have removed all of the leaves. We chopped the center of the cabbage and put it into the stuffing mix. 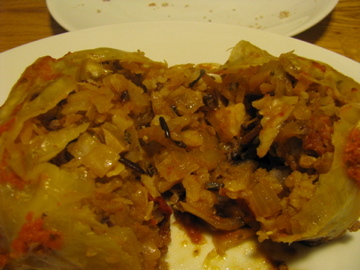 Put a spoonful or two of mixture into the center of each cabbage leaf and wrap it up. 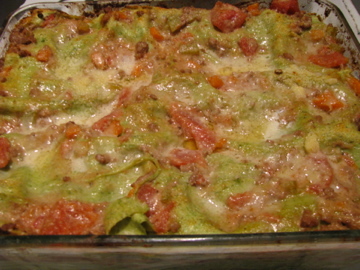 Place in an oven proof dish. pack the rolls snugly together, cover with the remaining tomato sauce ( a couple of cups). 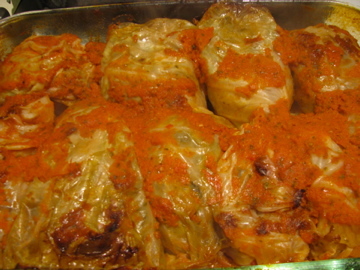 Cover with foil and bake at 350ºF for 1 1/2 hours. Everything should be tender and the sauce bubbling. They were still steaming hot half an hour after we took them out of the oven. This is adapted from a magazine recipe I have had for years. The recipe used ground beef and I have in the past made it with ground buffalo. If you use meat, you would really cut down on the amount of pumpkin.